At Dixon Law Office, bicycle accidents are not just another type of case we handle, they are some of the most important cases we work on. Why? Because Dixon Law Office founder, Grant Dixon, is an avid cyclist. Grant Dixon knows how dangerous the roads are for cyclists. “I am riding my bike nearly every day. I know what it is like being on the road.” Grant continued, “Most drivers are irritated by bicycles and many drive like the bicyclist has no right to be on the road,” Grant said. Grant’s vast bicycling experience has earned him recognition as a cyclist and a lawyer. In 2010, he participated in RAGBRAI, an annual bicycle ride across Iowa. 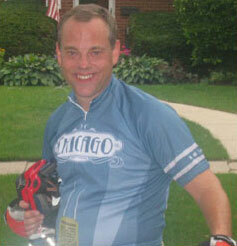 His cycling prowess was featured by the Chicago-Daily-Law-Bulletin. At Dixon Law Office, we have experience in handling nearly every type of bicycle accident case imaginable. We have represented bicyclists who have been hit by cars, trucks, and vans. We have handled cases involving bicycles that were manufactured improperly and cases of bicycles that were not properly assembled. We have even handled cases of bicyclists who were injured by road defects such as potholes, cracks, and sewer grates. Often the injuries are catastrophic. Sometimes less so. “Cycling can be dangerous but in my experience it is almost always because someone else did something wrong,” Grant said. Accident statistics show that to be true. According to the National Highway Transportation Safety Administration, 716 bicyclists were killed and more than 52,000 were injured in bicycle accidents. Most bicycle accidents occurred in cities and urban areas (69 percent) but only about 36% of all bicycle accidents occurred at intersections. The most dangerous hours for bicyclists are between 5 p.m. and 9 p.m. The average age of those killed in bicycle accidents was 32 and only about 12% of bicycle accident victims are between the ages of five and 15. More people died in bicycle accidents in Florida than any other state: 125 in 2008. However, Delaware has more bicycle deaths per population than any other state. At Dixon Law Office, we help bike accident victims recover the compensation they need. We have extensive experience with cases involving catastrophic injury and wrongful death. For a free consultation with a personal injury lawyer, please call (888) 354-9880 or contact us online. Children are often victims of bicycle accidents. They may suffer severe injury, especially if they were not wearing a bike helmet. These types of accidents can result in injuries to the brain, spine, arms and legs, and internal organs. When the injuries are this serious, wrongful death may also occur. In addition to accident claims, we also represent people injured by defective bicycles. Please call our office at (888) 354-9880 to schedule an appointment with our Cook County bicycle accident attorney.